Every once in a while I am shocked and left speechless. After researching so many failed opportunities to really harness new media, Browning’s presence is like a beacon of light shining out of a computer monitor onto the floor of SHOT. And no, I’m not just saying that because I’m in love with the Cynergy. I’m setting my Cynergy love aside for this review. First, I decided to check out Browning after reading The Hog Blog’s review of their new Maxus shotgun from Media Day. I wondered if they even had anything on their website about this new gun now that fans were talking about shooting it. Seems kind of important when it comes to media, yet so many seem to fail at this simple task. If you have people talking about it, make sure they can come to you as the producer and get details so they can make the decision on whether they want to buy it when it is out on the gun store racks. Score! Browning has the information right on their front page. Even better? It’s under a link to a blog that’s being run during SHOT Show with actual live updates from the floor. I believe my words, upon seeing an actual updated real life inspired post, were inspired by Heeding God’s Call: Holy crap! More importantly, even though they announced their new gun back in November, Browning realizes that writers will start talking about their product now that they have it in hand. Since that starts with SHOT, they made sure that release was still on the front page. Even better, if you’re really interested in this new line, it’s easy to sign up to get more information from Browning as the product rolls out this year. Customers, they are a good thing! But the good news on new media integration doesn’t end there for Browning. Remember how I highlighted Facebook groups for Ruger that had self-identified customers and nothing was posted about their new rifles and handguns? Browning is so ahead of that curve. 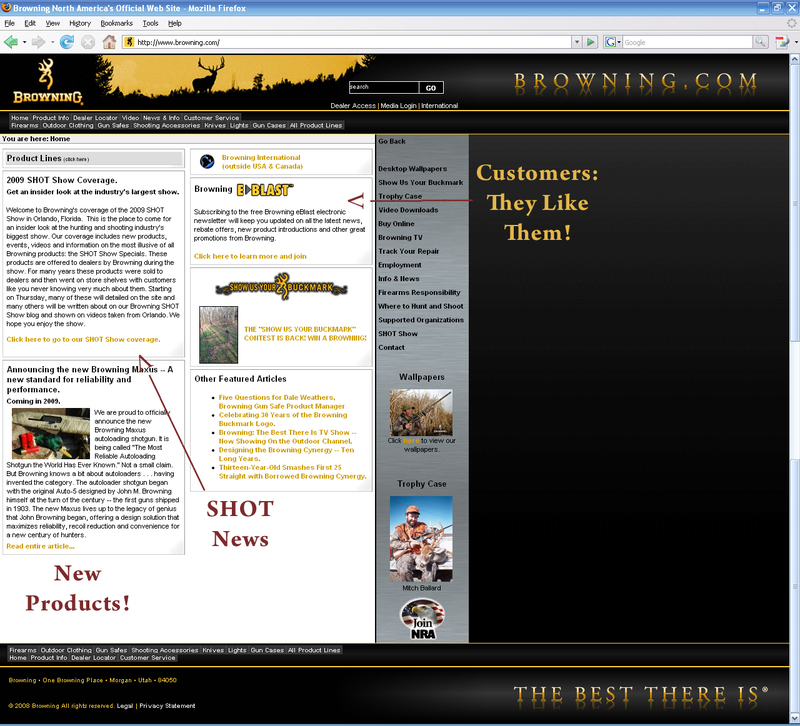 There’s the official Browning page which 2,125 fans, posts started on the discussion board by Browning staff about what customers want from their social networking outreach, an announcement about their own SHOT coverage, fans bragging about looking forward to the new gun, videos, and photos. It does look like postings by Browning are a little sparse, but hopefully that will improve. I would suggest that Browning bring the 30 fans of the John M. Browning page in on the fun. Maybe join that group and add some fun facts or engage it a little more. It’s a small group, but they are folks who obviously love the man and hopefully the products still produced under his namesake. However, it’s interesting that Browning opted to start a page instead of a group. It doesn’t appear that they are adding applications to it, but maybe they valued the tracking abilities over the higher profile personal messaging benefits of groups. The Browning Group (704 members) and Browning-The Best There Is Group (550 members) don’t have any posts or news at all. While I understand that Browning has an official page, I don’t think that it’s worthwhile to write 1,254 members of other groups off. Featured prominently on Browning’s SHOT blog is a video link. They have a small little video player that has, as of “press” time, five videos showcasing products actually on the floor there at SHOT. Four are about other products, and one is actual footage from Media Day. However, none of these videos can be shared or posted. If I wanted to share their video about the absolutely gorgeous John Moses Browning Signature Gun Case with a friend who might be interested, I can’t do that easily. I would have to tell them to go to the video page and find it, something that will become much harder once they upload more videos. It’s Midnight, Where are the Video Updates? I wish I could share your enthusiasm for Browning. I also wish I could buy a new Browning Hi-Power in 9mm. As it is, Browning still has the HP on their site, but nobody seems to carry them any more. I don’t think you get what I’m talking about. Beyond the Cynergy, I could give a damn about their guns. I’m reporting on their new media efforts. 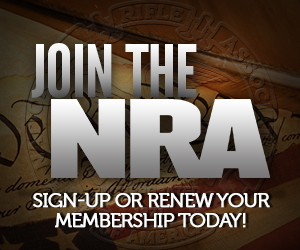 GunsAmerica.com is on MySpace in a semi-big way and is just starting on Facebook. You probably knew that, just sayin’ in case ya didn’t! One reason why I don’t emphasize MySpace as much is because I think Facebook has a much better design and more functionality for social networking. I also look at the trends for Facebook that are increasing so quickly, and I see more potential bang for your buck there.